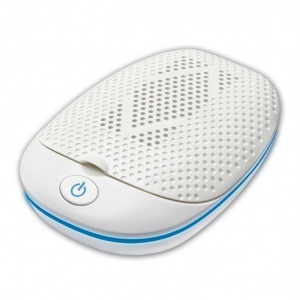 The Amplicomms DB 130 Mini Hearing Aid Drying Box is a portable device designed to expertly dry hearing aids. It eliminates up to 99.9% of germs, and helps to extend the longevity of the hearing aid. To ensure that hearing aids can be as clean and hygienic as possible, the DB 130 Mini Hearing Aid Drying Box has been designed to kill up to 99.9% of germs. As hearing aids are used in close proximity to the ear canal, it is crucial that sufficient cleanliness is maintained, and this is provided by the DB 130 Mini. The drying box has been approved by accredited laboratory Bureau Veritas for assured quality with hygiene maintenance. In addition to offering a more cleanly approach to hearing assistance, ensuring the hearing aid is kept clean can also help to increase its lifespan. 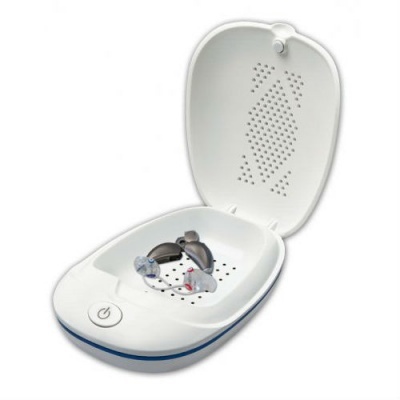 The Hearing Aid Drying Box utilises a gentle air circulation for drying the hearing aid, which does not impact on the material of the hearing heads. Sterilisation occurs by UV-C light at 253.7nm for a gentle yet effective cleaning that does not compromise the quality of the hearing aid. As use of hearing aids are pivotal for many people to carry on living a normal, routine life, this compact DV 130 Mini is both easy and quick to set up and use. The single-button operation means there are no fiddly or complicated settings with which to become accustomed, and the hearing aid can be inserted with ease for cleaning as and when it is required. The drying box also has a built-in auto turn-off feature. This will help to increase the longevity and performance of the drying box by ensuring it is not left on for too long when not in operation. The Amplicomms DB 130 Mini Hearing Aid Drying Box is compact in size, making it ideal for adding to luggage or slipping into a handbag when travelling. Whether going on holiday or visiting family and friends, it will be important to ensure that hearing aids can be cleaned with ease. The size of this portable device is practical for making sure that this can happen no matter where cleaning of hearing aids is required. It also comes with a handy carry pouch to help protect the drying box and make it easier to transport.